A teenager has been arrested on suspicion of malicious communications after Brit Olympic diver Tom Daley was swamped by abusive tweets. The unnamed 17-year-old suspect was cuffed at a guesthouse in the Weymouth area earlier today, according to the BBC. Dorset police's press office wasn't responding to calls from The Register at time of writing. It's understood that cops began investigating the activity of certain Twitter users, including the detained teenager, after it was revealed last night that Daley had been bashed by an internet troll on the 140-character messaging site. Daley, whose father died of brain cancer in 2011, came fourth in the men's synchronised 10m platform diving Olympic event on Monday. 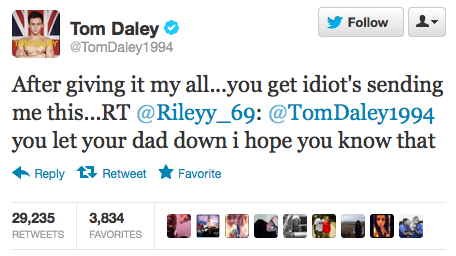 The 18-year-old ace athlete retweeted the abuse from the Twitter account-holder who goes by the handle Rileyy_69.